You know that old line about “Please, don’t shoot the messenger”? Well, The CW has done just that. The network has cancelled The Messengers after one season. Only three episodes have aired thus far. On The Messengers TV show, a mysterious object plummets to Earth and explodes in a blinding flash. It sends out a shock wave that instantly connects five strangers. They receive extraordinary gifts, from inexplicable strength to the ability to heal others. 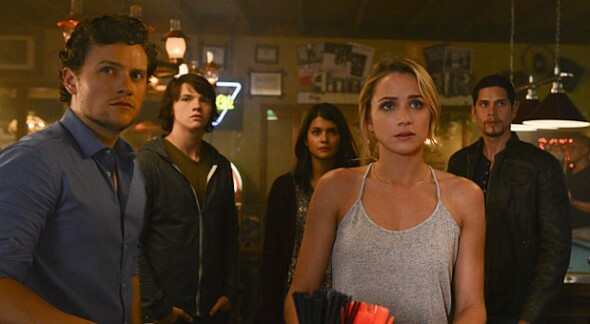 The cast includes Shantel VanSanten, Jon Fletcher, Sofia Black-D’Elia, J. D. Pardo, Joel Courtney, Anna Diop, and Diogo Morgado. The move to cancel the series doesn’t come as much of a surprise. The Messengers has performed quite poorly so far, even for a Friday night show. Last week’s installment hit a new low with just 650,000 viewers and a 0.2 rating in the 18-49 demographic. For now, it looks like the series will stay on the air to finish out its run of 13 total episodes. What do you think? Do you like The Messengers? Do you think that it should have been cancelled or renewed for a second season? I think they should’ve continued the show to see where things lead. This show kept me interested for a weekend binge. This is perfect for Netflix to reinvent. Hey go for it with a reboot. It has superpowers, a hint of mystic prophecy, religion, relationships, good vs evil; plenty of drama to go around, combined with a logical action storyline. I wish Netflix would pick this show up. I just watched the only season and was hooked. I got my sis and mom watching too b4 we realized there was only one season. Now we are hooked with nothing to go on. Ugh. Please bring it back!!! Please someone pick this show up! This was a great show! Loved it. Some network should pick it up. The showdown with anti-christ and the arcangel alone would have been very interesting and exciting to watch. Please bring it back..somebody! Enjoyed Season 1 of The Messengers. Would love it if Netflix picked it up for more seasons to find out about the AntiChrist and the Archangel. They’ve done a good job, so should continue the story. I agree with you @Carmen that Netflix should pick it up again. I hope season 2 will be good. I really wish they continued this show it was so interesting !!! I would have loved to see the development of the Antichrist and Archangel….. Don’t want to spoil it for people who haven’t seen the series but you should seriously check it out !!! I think I has a good story telling, of course that the first 3 chapters are weird but, that how it is, let them to roll and to engrained all the part together, like a book. It was an interesting show. I was hoping for a second season! I hope Netflix picks it up. I wish that it would add another season 2 although I understand that if it wasn’t doing well then it had to be canceled.